Dollar Academy, Scotland (Highschool) Queens University, Canada (BA and MA) The University of Edinburgh (PhD) In June 2006, Sara graduated from Edinburgh University with a PhD in Ancient History and Religion. Sara's dissertation was in the field of women's history. She analyzed the methodology of women's history, specifically in relation to women in the first two centuries. Sara is passionate about the need to make sure that women figure as often and as highly as men on the pages of our history textbooks. Growing up in Canada Sara played a number of team sports, her favorite being soccer (or football for the British crowd). At one stage she even played on 3 teams at once, practicing every morning and evening with matches up to five times a week. 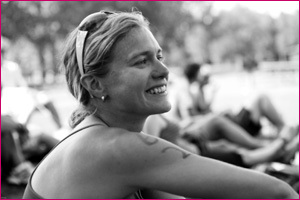 After moving to the Middle East with her family in 1991, Sara took up individual sports including running and swimming. Sara swam competitively in University but claims she was never very fast. She was also a recreational runner for 10 years before taking up triathlon. After spectating at the K-town Tri in Kingston Ontario in 1999, Sara bought a bike and started training for her first triathlon.